As B2B purchases become more complex, it’s important to take a look at some of the latest B2B buyer trends in the market. Buyers are becoming more selective in terms of the content they consume, to make their buying decision. While B2B buyers continue to rely on trustworthy and credible sources, expert opinions and their peers to inform and educate themselves, their content preferences keep fluctuating over time, with various new content formats being introduced into the market. 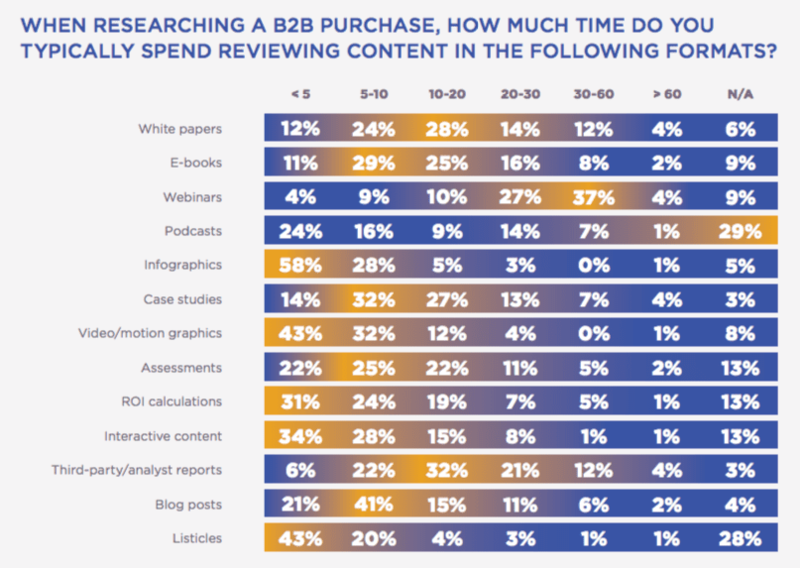 According to Demand Gen Report’s annual survey on content preferences, B2B buyers are “becoming more discerning and selective in the content they decide to consume”. Majority of the respondents (88%) said that content producers need to focus less on content around product specifics and more on the value that can be brought to the business. Around 75% of the respondents agreed that content producers should use more research and statistical data to support the claims made in their content. The key outtakes from the survey also highlighted that blog posts were cited as one of the most consumed content types, with 71% of respondents stating that they regularly read blog posts while on their buying journey. As a lot of marketers would say, there is now an information overload online. With so many different types of content available, it’s vital to know where each of them fit on a buyer’s decision making journey, integrated with the marketing funnel. And that is exactly what the result from the content preference survey shows us. The survey was answered by around 170 B2B marketing representatives, in senior positions, across multiple verticals, possessing more of the decision maker powers. 66% of B2B buyers strongly agree that companies should make it easier to access their content — from fewer form fields to even single-click content options. Interestingly, webinars also topped the list including content types that buyers are willing to spend most time consuming. Webinars were tied with white papers as top buyer content preferences that buyers were willing to share their information for, with around 75% of respondents stating that they would share more information to receive webinar content. The popularity of webinar content may be attributed to the unique content, usually delivered by industry-led experts, which causes a sense of FOMO – fear of missing out, within the consumers. This guide will show you how to effectively plan and promote your webinar. You will also learn about the different types of webinars and how to choose the best type for your business objectives. For late-stage content, the most-preferred formats were ROI calculators (48%), case studies (40%) and assessments (40%), considered to be most valuable to make the final buying decisions. This highlights the need of more detailed, value-driven content types at the bottom end of the funnel, consisting specific, data-driven insight into how certain tactics are likely to benefit their business. 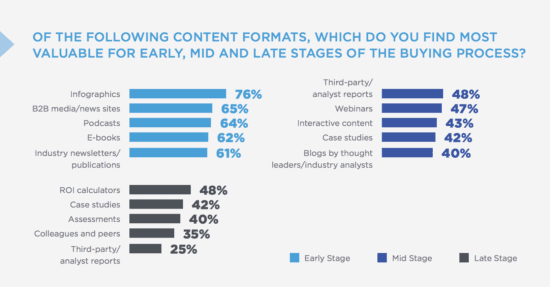 Which content marketing formats support B2B buyers?